Market Sentiment Watch: Busy week on the energy data front. In energyland, all eyes remain on oil and this we get a raft of new data from IEA, EIA, and OPEC. Look for some rebalancing trades in the ZLT in the next two weeks. In today's post please find The Week That Was, some quick follow up cheat sheets as we get unburied from last week's earnings announcements, comments on the PDCE quarter (in line with increased guidance including spending but the cash flow neutral and 2016 growth comments should be more than supportive), and a few other odds and ends. No economic release scheduled. We do get the EIA Drilling Report Update and potentially the IEA Monthly report. Friday 8/14: PPI, industrial production, capacity utilization, consumer sentiment. Crude oil closed off 7% last week at $43.87. Brent and the OPEC basket were off 7 and 8% respectively last week as well. Oil ignored a bigger than expected draw on crude stocks and record refiner throughput to focus on a small edge back up in production (up 52 Mbopd on the week vs the prior week's 151 Mbopd drop). See The Week That Was section below for more comments. This morning crude is trading just over $44. OPEC Watch: Algeria reporting OPEC members are "engaged in negotiations on the possibility of holding an emergency meeting" due to the recent price decline. Unless Saudi is on board and unless others are willing to contribute to a curtailment they can talk all they want and it will not matter. China Watch: Oil imports to China reached a record 7.3 mm bopd ... yet we saw headlines last night and this morning attributing early crude weakness in part to weak China data. CFTC Watch: Speculators slighty increased the net long position last week after 6 weeks of decline. Natural gas rose 2% to close at $2.80 last week. EIA reported a smaller than expected injection of 32 Bcf which was also below the five year average injection for the week. Blame heat. See The Week That Was section below for more comments. This morning gas is trading up slightly. Last week's weather: Population Weighed Cooling Degree Days were 74 vs 73 normal for this week of the year (the previous forecast was 80 so it was cooler than expected) and cooler than the 90 CDD reading in the prior week that produced the 32 Bcf injection last week. This week's forecast: CDDs are forecast to bounce back to 80 vs 69 normal for this week of the year. 2Q15 production and EBITDA beat. 2015 spending and volume guidance reiterated. 2016 - too early for official guidance but they think they can hold the year flat to 2015 (which itself is set to be flat with 2014) on a 15 well budget (which you can see our assumptions for below). Flat in 2016 would be slightly better than the current Street outlook. On the current strip they see 2H15 as cash flow neutral to more likely slightly cash flow positive. In 2016 they indicated they could hold volumes flat to up slightly on a cash flow neutral budget at $50 oil or grow a bit more and stay cash flow neutral at a slightly higher oil price. Liquidity remains high and leverage remains below 3x and debt should hold near flat at worst or continue to erode as it has since 3Q15 (combination of an equity offering and cash flow). For those that say "but it's not growing" I saw but it's likely to pare back debt slowly from here. And they are forgetting that the well economics are now greatly improved at the current strip. Given the better economics we don't think it's appropriately valued, given the breadth of inventory that works here, at one of the lows on a BOEpd basis. We see this as a long term opportunity to add to a what will be a survivor in the space while the Street sits on it's hands, alternatively penalizing some names for growing while penalizing others for managing to find that long lost thing called discipline. 2015 Spending: Boosted to a range of $520 to $550 mm vs prior level of $473 mm. Drilling and completing more wells than expected. Due to faster drill times they will cut the rig count in 2H15 and to be cash flow neutral on the current strip in 2H15. Initiated 3Q15: sees "very solid third quarter production" due to strong early results from long lateral wells. Favorite Quote Watch: "Based on the current commodity price outlook, the Company targets operating in a cash flow neutral environment in 2016, while operating four drilling rigs and delivering approximately 35 percent production growth over 2015 levels"
2016: The 35% growth over 2015 levels equates to 54.9 MBOEpd; the Street is current at 48.8 MBOEpd. Wattenberg - Noting "enhanced production results" due to tighter frac density, plug and perf, use of Biover (HAL), and extended reach drilling - look for color on the comment on the call. Utica - 4 well Cole pad outperforming expectations (no color) and continued strong performance from the Dynamite 4 well pad. Liquidity: $387 mm vs prior reading of $505 mm; now 14% drawn including letters of credit and excluding the $250 mm of additional borrowing base that is available above their self limited $450 mm cap. Nutshell: In line quarter. The Street has taken a sharp view of capex boosts this year even with increases in guidance. We would expect any negative move to be quite short lived, subject to technical patterns triggered in the stock by them, given the more than solid balance sheet, ongoing solid operations, and strong comments regarding 2016. We continue to hold a Starter Core position in the ZLT and are likely to add to the name soon. We get earnings reports from EXXI, and PE (after close on Tuesday) this week as the 2Q15 season winds to a close. CRZO - Imperial cuts target from $62 to $48 (no idea what they heard to prompt this but looks more like mark to market of a stale target). This entry was posted on Monday, August 10th, 2015 at 7:45 am	and is filed under nog, oas, PDCE, Uncategorized. You can follow any responses to this entry through the RSS 2.0 feed. You can leave a response, or trackback from your own site. 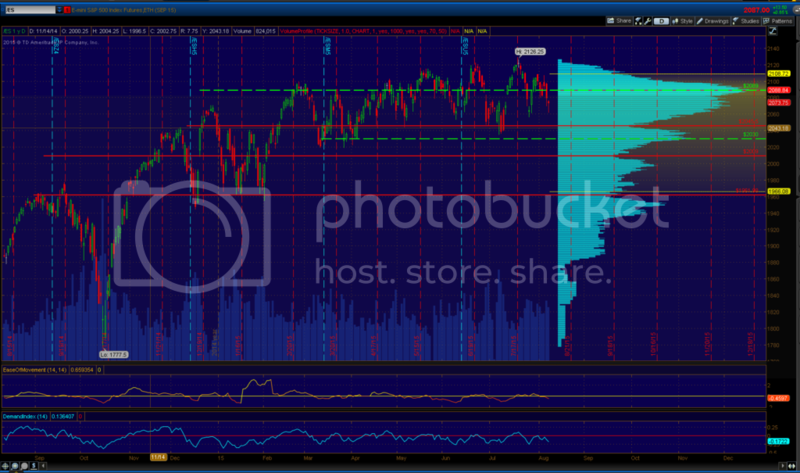 Notes – Multi-month range/dense congestion. Range expansion above 2112. Demand volume negative. Ease of movement negative. Sentiment = Extreme fear. Thoughts – No changes…Multi-Month range trade around major acceptance at 2089 continues. XOP Wide and very sloppy effort to find balance with bounces continuing to meet supply/dense congestion and crude continuing to slide. 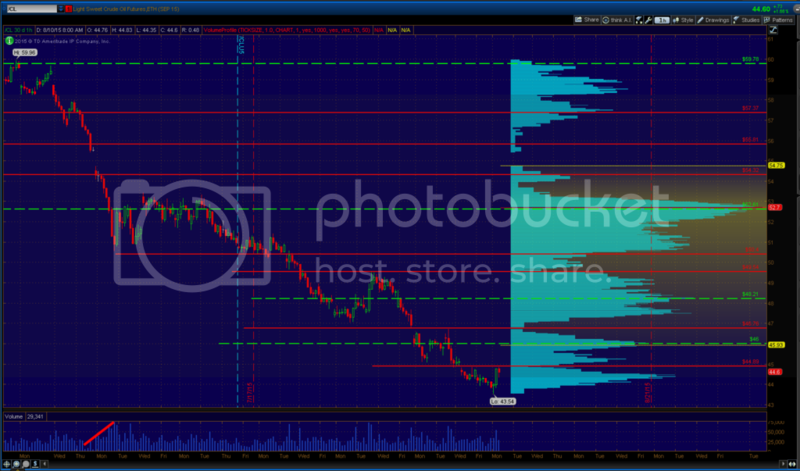 OAS – Simmons ups NAV target by $2 to $24.Stays Neutral …. because, I mean, um $9.55 vs $24 … who would want that? PDCE – initial reaction green and testing the 200 day SMA from below. Nrgyman….could I get your picks on the top three solar stock opportunities at the moment. Thanks in advance. RE 6: Sure, but I'm no expert on the sector. I bought SUNE late Friday due to the huge selloff. That may be the best long-term solar name, but they have some warts ($11B in debt for one). SPWR is another name I like. Less enthusiastic about FSLR and SCTY. "while SCI (Simmons) has had no concern regarding liquidity for OAS, positive commentary with respect to OMS divestiture (which we didn't bother to include in our wrap above) and bank redeterminations should help alleviate investor concern … with more attractive valuation, no real liquidity concerns, OAS looks to be both well positioned and incredibly levered to benefit from improving prices in time" … All talk, no spine. Sheesh, ugh, etc. re 8 – appreciate the thoughts here as well as I plan on doing some reading after catching up on a few things. PDCE looked good this morning. Z Got to read some CC's over the weekend. EOG – was that Riverview discovery (Antelope) outside of the 4 counties perceived as core Bakken? Saw cost /well in Bakken EOG $7.1mm NOG $7.3mm and OAS $7.9mm. Maybe OAS is a little high right now. Brent will be range-bound through 2H15 and much of 2016, bank says in note. not that i disagree with his "won't hit lows call" but bold call considering we are $1 or so away. 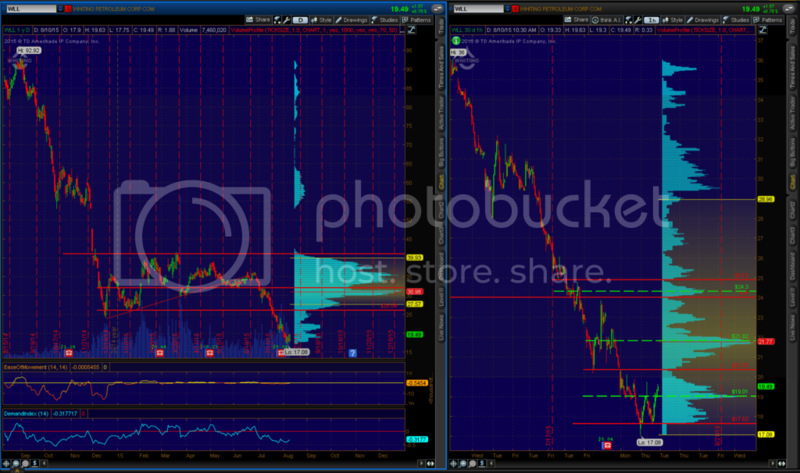 I love when analysts miss a $60 move in oil but call a $1 move. EOX – Do you consider the JV with Koch Exploration to be significant for them? EOX still on your to be sold list? Bakken differentials. EOX $8.50 over next 3 quarters. NOG $11.50 2ndq '15 vs $12.25 in 2ndq '14. Expecting $10 in second half. Do you have guesstimate as to when some pipe will be knocking these figures lower? Seems like Permian has the advantage in this one category. I bought some EOG calls this morning. I find it hard not to like these guys. re 12 – Antelope is along the Nesson in east McKenzie so it's in the middle of the 4 counties, it's not what EOG calls core , just west of it but it's what is considered core in the 4.
re 12 – I saw a broker make that comment. I'd say no, depends on depth, lateral length, sand load, slick vs gel vs hybrid to get to the CWC. To call OAS high is probably not comparing apples to apples especially vs EOG. Are they higher, yes, is the straw the same, no. OAS is going to be deeper than EOG as it's neear the bottom of the basin, especially with this year's program which primarily targets north McKenzie (just under the river) at Indian Hills and while OAS has gone to a big and increasing % of wells with enhanced completions, which adds more cost (een as the total comes down sharply from last year) I don't have good data on how much of the EOG well count is enhanced this year or see that EOG has done much in the way of enhanced completions outside of it's core (which the Antelope was and just east of Indian Hills. re 14 – I think it's a can kick. They need higher prices. Yes. Differentials may or may not include transportation so that varies. Some guys will say $6 and you might think pre hedge realized of $6 but they need another $5 to get it hauled. Re Permian – it has for a long time. re 13 – Hear ya, are we not prices basically at YTD lows now? Given the technical break I'd be surprised if we don't see lower prices, barring OPEC action which I'd put in the unlikely camp, when inventories start to lift after the end of the driving season as refiners ease back. We get a lot more data this week, might have been wise to wait to see it before calling the bottom. #8 thanks…you follow them more closely than I do…I haven't looked at them in years until this latest wipeout. PDCE – nice break of the descending 200 day sma on earnings. Call in 30 minutes. OAS – attempting to top Friday peak now. REXX defiance of usual gravity persists for a whopping 3rd day. PCE call about to being, notes in a bit. Anyone see a report date for EXXI? re 25: they haven't announced yet. will announce a date this week. probably end of month. just talked to them. Z Any thoughts about the 8.2% stake in LNG that T Boone took? Capex higher on more drilling and non consents … Increased spud and TIL (turn in line) counts while cutting rig count from 5 to 4. See "Over 35%" volume growth next year. Results include first batch of XRL wells in their Inner Core Wattenberg. Quarter recap on slide 15. LOE expected to continue to fall on a per BOE basis. Benefits of PnP and Biovert not included in the guidance. Each Watt drilling 35 wells per year instead of 25 wells per year (short laterals). We try to take this into account when looking at efficiency but are not taking that big a move into account. 2017 – still thinking same 60,000 BOEpd net. 2017 – 1.6 to 1.7x debt to EBITDA. Biggest change in the model for them is a function of lower NGLs at both Watt and Utica and weaker gas prices at Utica. A) Look for oil mix to go down a bit in 2016 as inner core wells come in with big gas rate, very economic wells but gassier. Moves back up in 2017 with more Middle Core. Will have actual percentages in December but they won't be in the lower 40%s in 2016 for oil with liquids at about 63 to 64%. Q) PnP vs sliding sleeve. A) On standard laterals should be similar, on the XRLs it looks better, but it's still early to say due to some start up issues we had with producing them consistently. Reiterate that PnP and Biovert NOT included in guidance. We're very excited about where we are headed but it's early to put in guidance yet. Doing some early work looking about the US for other basin opportunities. Projecting 17% of WTI for NGL to last through 2017, trying to be conservative. Utica will be on decline in 2016 and 2017 as all we have is a 3 well pad in Washington County in 2016 – will be a good learning experience as it's in the condensate window. Has been done across the field – have not yet combined the PnP with a Biovert – designing first of those wells now. 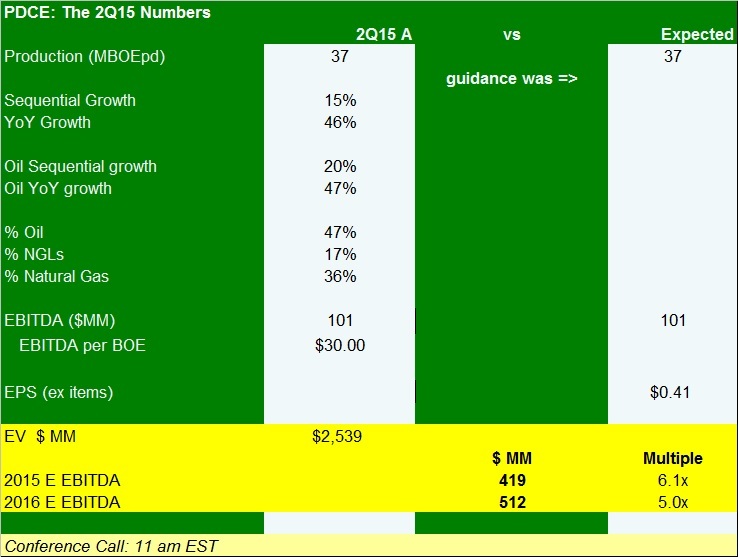 PDCE call tone – analysts drooling over the call. RE 34: Thanks for the CC comments. My thought is they should sell their Utica assets for cash and buy BCEI with stock instead of looking around for other basins to get started in. re 35 – that may take more data and patience than some have. RE 37: They could buy BCEI now with stock. Sell Utica later when natgas improves. They have the financial strength so no need to sell Utica now at depressed prices. But the expansion of their Wattenberg assets would give them more scale in a strong IRR basin that they are doing a fine job of exploiting, improve economics, make them a pure Wattenberg player after Utica sale. Utica sale would be a nice cash infusion later to expand development/reduce debt (acquired from BCEI) with. re 38 – ah, thought you meant sell it now in 36. Call still rolling along at 1:17 mark. Very positive tone. Conservative guys, not going to really bite on the M&A questions, not going to monetize the hedges and slow down, continuing to suggest they are not done with spud to spud time reductions. 10+ "congrats on the results" so far. Analysts care a lot more about Buy rates stocks than neutral ones and are asking every question under the sun on well tests. Also helps to not hold your call during rush hour. A) expecting negative price adjustments, doesn't think it hurts them at all, could be a slight down on borrowing base but that would not touch the self limited commitment level. Longest call of the quarter now. Q) regulatory environment in CO? A) Implementation of 2 things: Urban development operators (that's not BCEI), not going to severely impact PDCE and then air regulations which are challenging but not impeding program and has become a bigger portion of LOE but is included in LOE guide … not a big deal for capex. A) Inner core pretty much drilled up after 2015, focus to be on Middle Core and Outer Core. As we recently noted in a cheat sheet (inner core = 102, middle core = 1,772, and outer core of 865 locations). A) much of the growth is from wells drilled in 2015 carried into 2016. Drilling efficiency has been the most important factor in outperformance. PDCE call just ended. Tone overwhelmingly positive. BCEI: liking the PDCE call as well. Where does the quality of BCEI acreage fit in relation to PDCE's classification of Outer Core and Middle Core? Re TBP and LNG – just saw – that's certainly not a negative. Didn't Icahn announce a big piece there last week as well? re 43 – geographically to the northeast. From a type curve standpoint it's pretty in line, one reports 2 stream, one reports 3 stream (BCEI) – pretty equivalent looking numbers assuming some gross up of the 2 stream to get to a comparable number. PDCE saying 600 MBOE for a long lateral vs 687 MBOE for one of BCEI's legacy acreage wells. I think the PDCE number is a middle core number and that's where they have most of the locations so if not then it's probably heavily weighted to what they think a middle / outer well should be capable of. RE 43: Icahn's stake in LNG–good read. Not betting on natgas rally or LNG, but rather a slowdown in LNG expansion that will eventually lead to greater cash flow for shareholders. Interesting take. Of course a crude rally would likely help his investment. RE 44: Thanks. Confirms my thinking that BCEI acreage is similar to PDCE middle and outer core. BCEI cheaper due to balance sheet. More reasons for PDCE to buy BCEI while it is cheap–expansion of Wattenberg footprint without dilution of acreage quality, at a reasonable price now. Seems like buyers are fearful of crude prices dropping lower for longer and sellers are fearful of selling too low. 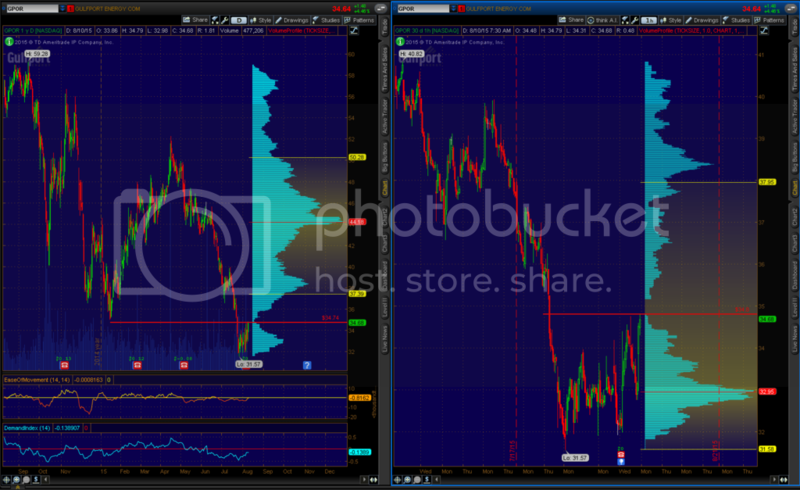 Hunch is bid/ask is narrowing but still too wide. Could narrow rapidly with a crude selloff this fall or widen if this rally continues. I think PDCE management should make it happen now with PDCE trading near the 50 dma and BCEI at almost half of its 50 dma. Stock for stock–no cash. PDCE becomes more leveraged due to BCEI debt, but a later Utica sale could take care of that problem. that strategy makes a lot of sense, but not sure PDCE would take on the exposure of debt at this moment. the street would see it as highly risky at this juncture and sell off may ensue. also not sure if BCEI would sell out even if the offer was 3x current trading price. Zorg – How's OAS looking to you now? RE 48: Agree PDCE concern would be added debt and BCEI concern is selling too low. PDCE can handle it though with their balance sheet. BCEI? In a stock for stock deal they would need to feel that taking a higher share price now, integrating with PDCE and riding together is a better proposition than waiting for a turnaround that may not be as robust as needed for their debt-heavy balance sheet. Comes down to the price and bid/ask is likely still too wide. Think PDCE should be more of a risk taker since they are trading paper (PDCE stock) for assets (BCEI leasehold and production) that they know very well and will give them greater long-term economic benefits. The Utica asset sale is extra financial support if they should need more capital in the future. PDCE is in a good position now to take advantage of the market's relative pricing of assets. #49 OAS … Right at the neck line (10.76) of a nice breakout setup that runs to 12.50,,,24% short interest last I saw….. looks a bit extended but if shorts flinch it could rip higher in spite of the extension. 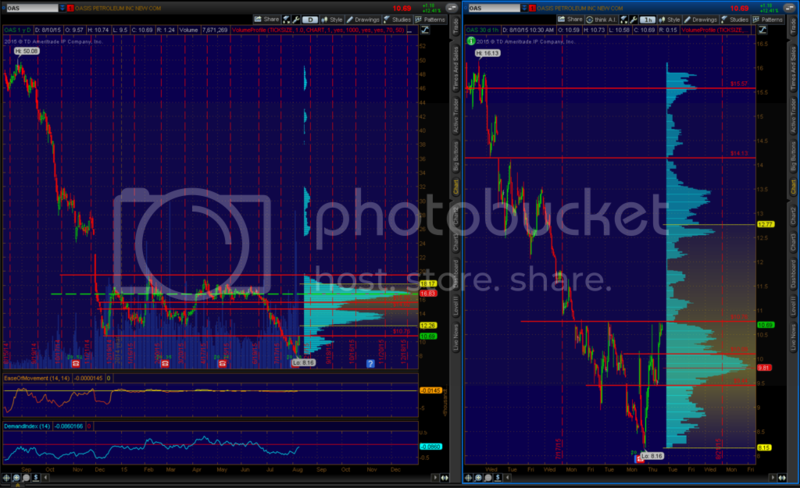 If not now, then a little back and forth would be fine with me and likely sustain the break better? re 51 – thanks. Expecting a solid quarter later this week out of PE with them pointing to bigger volumes in 2H15. .
WLL topped 19….based on your Friday read, think bulls starting to take control of tape…still think we go through see-saw action for a while, but the bottom may have been put in (barring any large inventory supply gains coming in fall). re 54 – just as a headsup, there is a lot of macro data coming out of the big 3 agencies today and tomorrow. PE Set to pop with a move above the 15.78 CLVN. 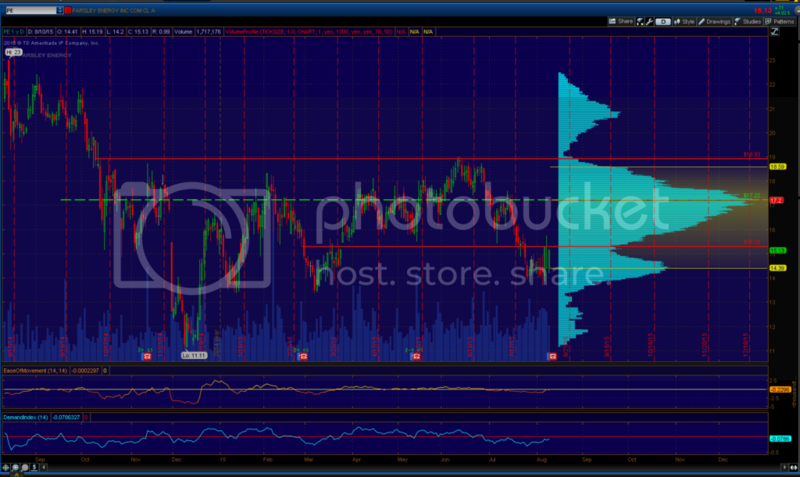 Initial upside target at 17.22 with far resistance at 18.93 the next likely range high. re 56 – or months. Not my thing in general but I see some stuff that doesn't make sense other than from a trapped long perspective and am taking on a few more of those kinds of things of late. Pretty mixed results in aggregate so far given weekly slide and short attention spans the followers of the group still hae and just the obvious (shorting of pops, selling of pops). CFTC showed a minor increase in net long positions last week after 6 weeks of slide and NG isn't falling off a cliff but looks increasingly constructive; things that are helpful to sentiment. I expect the IEA headlines to be as negative as ever this week. 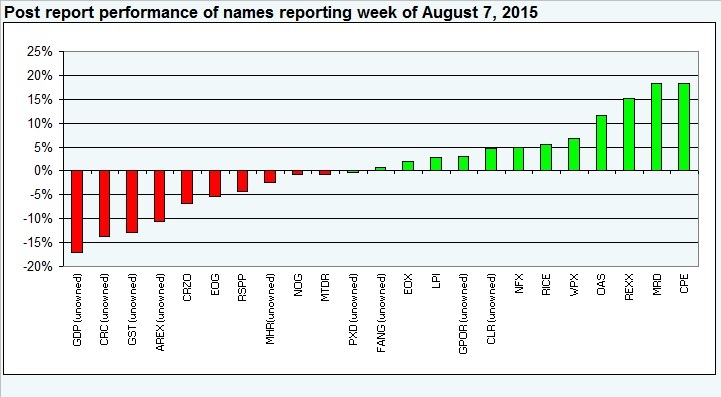 EIA neutral, OPEC same as last month (constructive re demand and destructive re non OPEC supply). XOP: Key reversal on Thursday held on Friday and today we see the price follow through. Not seeing big volume on the move today though, so plenty of non-believers. Anxious to see how the XOP responds to the macro data releases coming shortly. re 59 – thanks, will go have a look. re 58 – thanks, should be an upbeat report there, hard to tell on a beat, they had a head start on the quarter but completion timing would be key to it lasting vs consensus. 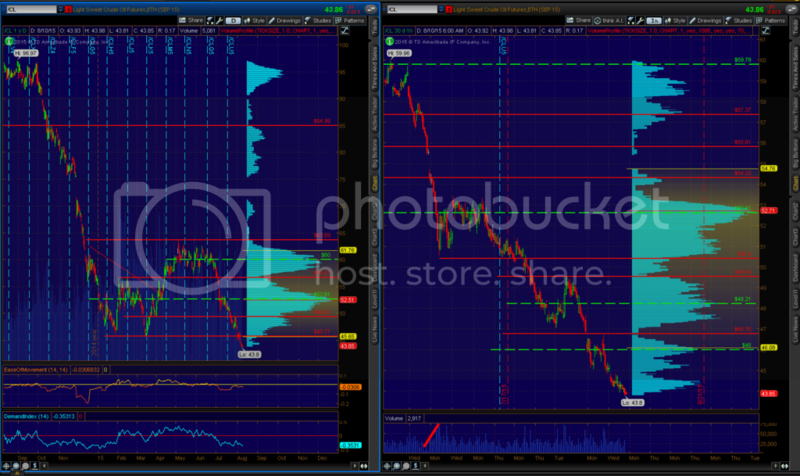 Either way, expect them to point to 2H15 volume hockeystick and more very strong results/lateral foot. #54 WLL Like to see a close above 19. Likely will. Next level of interest at 20.35 but I don't see a particularly easy spot ahead for this one ( or for a number of lower relative strength E&P stocks)…There are numerous levels of resistance/supply both long and short term to negotiate. — The shale fields that propelled the U.S. energy boom are expected to take another step back next month as oil companies reduce costs in the midst of a bear market. Production from the prolific tight-rock formations, such as the Eagle Ford in southern Texas, will decline by about 92,000 barrels a day in September to 5.27 million, the Energy Information Administration said Monday. It’s the fifth month in a row output is expected to slide, after more than tripling from 2007. Shale producers like EOG Resources Inc. have cut spending and reduced output after oil prices fell more than 20 percent from their 2015 peak in June, and remain down by more than half from a year ago. The number of rigs drilling for oil last week was 670, down from 1,609 in October, according to oil-field service company Baker Hughes Inc. The EIA’s production forecasts cover the yield from major plays that together accounted for 90 percent of domestic output growth from 2011 to 2012. Output from the Permian Basin in West Texas and New Mexico, the largest U.S. oil field, will rise by 8,000 barrels a day to 2.04 million. Production from the Eagle Ford, the second-largest, is expected to fall 56,000 barrels a day in September to 1.48 million. In the Bakken region of North Dakota, output will decline 27,000 to 1.16 million, the EIA said. The EIA’s oil-production estimates are based on the number of rigs drilling in each play and estimates on how productive they are. By subtantially – I mean Permian up 50% since December on IP30, Bakken up 32%, Eagle Ford up 27% (and down slightly from recent months), Niorara up 31% (also off a bit from their estimate over the summer) and the Utica up 36% YTD. So, again, this points to better wells in the core of core just not able to offset such a massive decline in the rig count in the core 5 plays that drove all the growth. re 64 – OMG – A headline I can agree with. Oil edged up on the drilling report, now waiting for the Goldman rebuttal. Speaking of Eld – anyone have a good reason for Capesize dry bulks to have shot higher of the last several weeks? This is says China but that can't be can it? Nice to see the gassy names participating as well. re 72 – appreciate the thoughts. Robry on Aug 7th was at 63. Will keep following and let you know when he comes up with a later one. Thanks for the reference to the Barron's "Capitulation" article. Great read and I think it may be helping with some of the green we see today. Wayne- notice Schiller speaking at Enercom conference next week. Anything new on debt reduction. I assume not looking at the price of the stock. re 77 – have not read it, can you relay the cliff note version? Re: 72…I have tried using a lot of things to help me decide when to get more aggressive or more defensive. I once thought I'd found the holy grail using the Bullish Percent indices and some of you may remember when I posted that. But after a lot of time and thought I prefer the relative strength charts. The draw patterns just like a stock chart does, with lines of resistance, support etc. Anyhow, I'm going to keep putting them out there now and then and I suggest others tinker with this notion. Some have suggested it is flawed because the XOP includes so many refiners. And I admit that the makeup of the XOP changes frequently but it is the best thing I've found. re 80 – when did it go down? Wayne – if you would kindly execute the rest of your OAS buy I'd be happy to toss the $11 strikes I still have. 😉 Saw the Dicker note on Twitter earlier "$130 by 2015" rmo June 2014 Thanks for the ha,ha. z – when you have some free time, check out SN. Pretty impressive there and a nice day to report. re 86 – will do, was planning on reviewing but had them reporting a day later than they did so ran out of time. 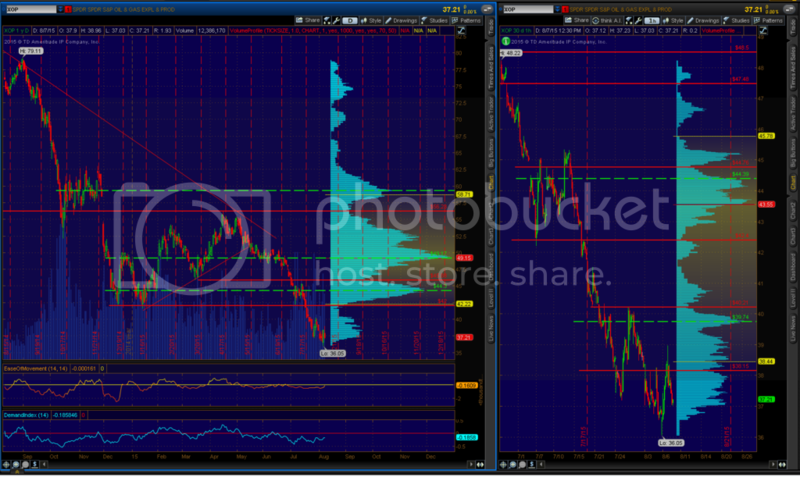 XOP Impressive move through dense congestion. Supply dwindles quickly above 39.74. 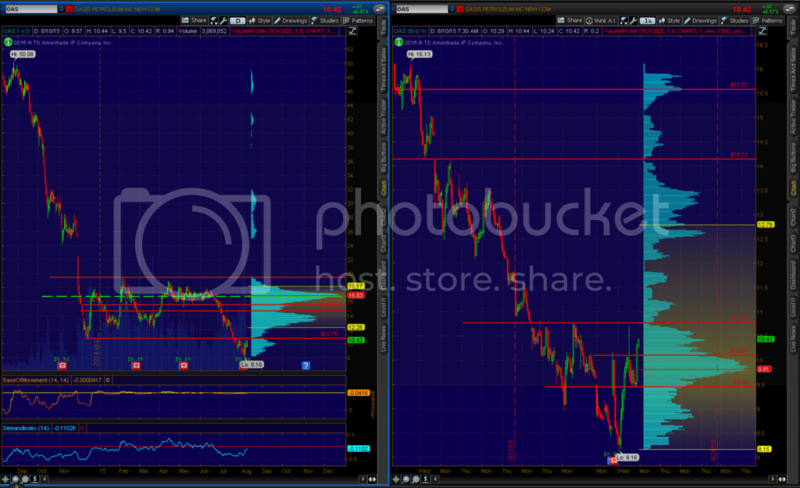 A break above near resistance at 40.21 has room to move quickly to 42 if/when. Short term extended now. Catalyst…..Crude oil tested near resistance today at 44.48. 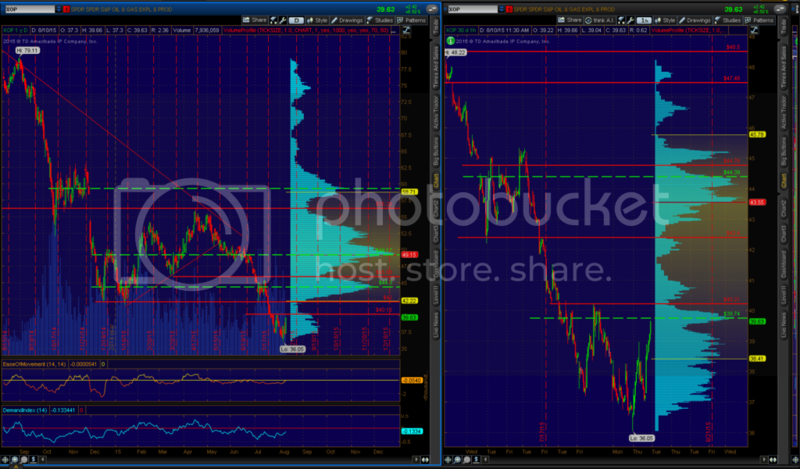 Look for a break above that level which then works to 46.
re 89 – thanks again for the levels, helpful. Wayne -any idea how long Mad Dog was down? I didn't find a thing on it so far. (Bloomberg) — BP restarting Mad Dog field today, earlier than previously planned, after maintenance that began July 31, according to person familiar w/ matter. re 93 – OK thanks. That would NOT explain the sharp dip in the 7/24 production data. All the risk names bouncing with the group. On Friday, after 2 days of pullback, energy HY spread hit a new high. Is today the first day we haven't seen a big pop not immediately sold? theres still tomorrow, but then again, tomorrow is Tuesday. which says nearly a $1 B in the works between pipe and JV. That's why I was asking about the rest. Anyway, I don't have anything on the line with this one but know some are still holders there which is why I asked. This is all about buying time, not a multiple of cash flow, which is probably wrong anyway If the street can be convinced that the company survives then the price quintuples. Eliminates the 'snipperites' and immediate balance sheet risk which for the 'smalls' is infinitely more important than EBITDA right now. Of course if gas fails to improve two years out it will become academic. re 103 – I wasn't speaking about a multiple cash flow. I was speaking about a multiple of debt, after the pipe is sold. As in, after they are sold, they would still be trading at 11x the 2Q15 annualized EBITDA run rate. Generally, that's a no-no. Adding to that, going off stuff from Friday, $930 mm of debt less $600 mm for pipe equals $330 mm of debt vs $7.5 mm of 2Q15 EBITDA x4 =$30 mm … $400 mm/ $30= 11x debt / annualized EBITDA. Re 96 and 98, But if you bought shares at $5 or 6 or 7 and then it did a 20 to 1 reverse split on you, maybe you made enough on it today to buy lunch. Yeah, but its not a normal market and time gets rewarded much more than coverage. I can assure you that there are quite a few outfits with much better balance sheets that will go away first because they didn't have any 'non in-kind' assets to barter, and because they didn't have any bankers willing or allowed to modify their debt which means that they simply could access something more valuable than ratio…….time. re 106 – see, that's the kind of comment on it I expect. re 107 – I'm not doubting you, just trying to filter your prose. 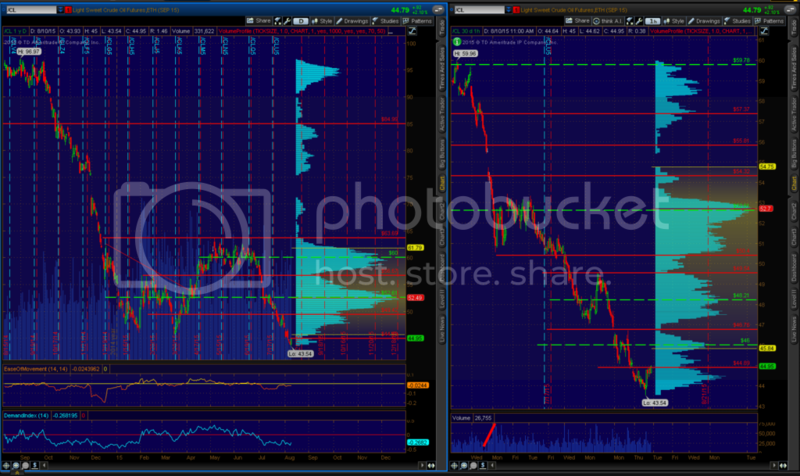 #109 Just sayin….this is a commodities game. Tell me what the price is two years out and what the production profile is two years out and then ratios and metrics will give you a fairly accurate picture of who continues on and how well. If the price is high enough a lot of ner-do-wells will absolutely shine. If low enough , then the are all toast. The issue is getting there over that time continuum. So its much more important to Mister Market right now that any fundies if you are a small cap. re 110 – sure, thanks. RE 110: Speaking of commodities: The global commodity currencies like the Canadian and Australian dollars are turning. The global commodity indices are turning. Each of these have violated extreme downtrend lines and started to turn higher. The US dollar rise is stalling, with a correction looking more possible. Anyone's guess if this is a short-covering bounce or a major bottom, but it is looking like at least a short-term commodity rally is at hand. The miners had a huge day today, along with the energy names. Would like to see more volume come into the upside, but it is mid-August and very few bulls can be found. The commodity sectors are significantly under-invested and the shorts are large, vocal and complacent–so any bullish data could ignite a white-hot, short-roasting rally. re 112 – all true. PBOC devaluing yuan by nearly 2%. And that will put an end to a string of up Tuesdays in oil. Difficult to say. Macro data out this week in my view more important.